If you’re lucky…a horse like Metallic will come into your life and he is known as a “once in a lifetime horse”! Dirk owns Metallic in partnership with David Burns from Wallington Park Equestrian Centre in Victoria. Metallic ticks every single box on the check list of what are “must haves” in the world of Dressage & Breeding. Pedigree, movement, looks, strength, natural talent and trainability, a truly beautiful temperament – a gentle, super soft side to his nature along with the required amounts of Testosterone and masculinity to transform him into the magnificent, highly respected breeding Stallion he is today. Since his arrival in October 2005 Metallic’s performance has grown from strength to strength and he DIRK had their first start at Prix St George level at the age of 6 years old! After a lengthy search in Holland (over 70 horses!!) in July 2005, Dirk came across Metallic. Already an eye catcher in the box, with his beautiful face and elegant body, Dirk was taken by Metallic’s totally relaxed mind when saddled and ridden. An awesome mover with a powerful, elevated and cadenced trot. He has not only a front leg with that rare knee action, but also an extremely active and powerful hind leg. The canter is pretty super too. The walk has a very big over track and again is super impressive. Genetically, Metallic has been very much performance bred. 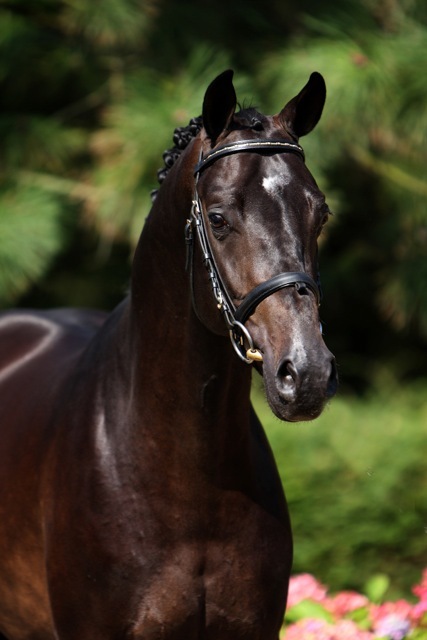 His Sire – Metall who is by the Dutch black pearl in breeding Olympic Ferro, three times Olympic team silver winner including at the Sydney Olympics. Metall’s dam is by the legendary G Ramiro who bred not only jumpers but also international dressage horses. Dirk’s relationship with Metallic is also one in a million and one that has been forged over the last eleven years. 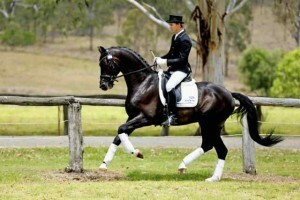 A relationship that not only seen Metallic Sire countless numbers of impressive off spring around Australia and overseas, but a relationship that has allowed Dirk to travel Australia competing Metallic in the extremely challenging sport of Dressage, successfully, at the very highest level – Grand Prix. Dirk continues today to breed and compete Metallic – many hours of training every day, week, month, year, in the pursuit of higher scores in his Grand Prix Tests. Metallic continues to mature and further develop his natural talent for the higher movements required at the top of the sport. Extraordinary levels of patience, dedication, belief and commitment on Dirk’s behalf and enormous trust, faith and stamina on Metallic’s behalf too. At home, Metallic is treated like the King that he richly deserves after giving his owners and all the people that have been lucky enough to be associated with him and his journey, enormous amounts of pride, pleasure and happiness. He is stabled every night of the year in a lovely barn with other horses in training and in a post and rail sand yard during the days. Situated on the property where Metallic can keep a close eye on all the horses and activities going on around him. He definitely knows he is the BOSS! His diet has always been kept extremely fuss free and simple. Plenty of good quality grass hay, a mix of good quality lucerne and grass hay in the night feed and a very simple mix of cool blend pellets (from Lauke Mill in SA) and a combo chaff mix. The legendary Metallic has proven himself to be an inspiration for the dressage sport in Australia as a top class performer as well as the sire of many outstanding moving foals around the country. Metallic has many stunning progeny out and about competing very successfully in the Dressage, Jumping and eventing circuit. He is a proven sire of talented, well-conformed progeny who have a trainable and kind attitude to work.